Chris Hughton admitted Brighton had fortune on their side in this afternoon's 1-0 win at Middlesbrough. The only goal of the game came in the final minute when George Friend's attempted clearance from Marks Suttner's cross canonned against Glenn Murray and flew into the goal. Albion had finished the game the stronger of the two sides but Boro had the better of the chances in the first half and went closest when Adama Traore struck a post. 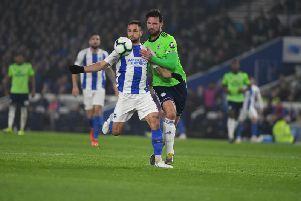 Brighton now go into the hat for the fifth round draw on Monday evening and Hughton, whose side scored away for the first time in more than 11 hours, said: "We've found goals hard to come by and there were periods where that showed. "Today it was probably going to take a little bit of a special goal from outside the box or somebody to make a mistake or a little bit of luck and we certainly got that little bit of fortune with the goal. "When you're a club like ours, you know it's going to be a tough season and you're probably going to have more bad days than good days. That's normal for a team in our position in the league, so you look forward to every good day. "It's good to come out the changing room looking forward to the draw and in the end I think we deserved it." On Murray's fortuitious goal, Hughton said: "With all strikers, you want to be in there, to anticipate. "It was a very good cross in there and Glenn did what he does. He's used to scoring all different types of goals and the majority of them are in the box." On selecting Murray after he received headlines in national newspapers during the week, Hughton added: "Glenn has been focused and I had no hesitation in putting him on."